How cool is this for a history nerd: Bob Thompson, author of "Born on a Mountaintop: On the Road with Davy Crockett and the Ghosts of the Wild Frontier" (Crown, 384 pages, illustrations, map, notes, index, bibliography, $27.00) being given a guided tour of the Alamo by Stephen L. Hardin, an academic historian of the military engagements that led to the creation of the Texas Republic in 1836. On Page 326, Thompson, who took an extended road trip to see the physical places of the events of the life of David Crockett (1786-1836) writes how he took advantage of Hardin's expertise to learn of the last few days in the life of "the King of the Wild Frontier," including where the remains of Crockett and the others who died at the Alamo are buried. Crockett arrived in San Antonio, Texas, home of the Alamo, just about a month before his death there. Hardin is the author of "Texan Iliad: A Military History of the Texas Revolution, 1835-1836" (University of Texas Press, 1994) a book I own and have found to be an invaluable -- and very readable -- guide to the events that led to the creation of a "whole 'nother nation." Hardin teaches history at Victoria College, about 30 miles from my home in Port Lavaca, Texas. It's based in Victoria, the nearest sizable city and itself a town with significance in the events of 1835-36. I thought I had read the ultimate Davy Crockett biography when I read and reviewed Michael Wallis' "David Crockett: The Lion of the West" on Sept. 29, 2011. (link: http://www.huntingtonnews.net/10424), but Thompson's book stacks up as a serious rival. Both Wallis and Thompson spend plenty of time on the less than three months out of the 49 years of Crockett's life that he spent in Texas, probably because -- as Wallis points out -- his final months in Texas are the ones most people remember if they think about Crockett. Especially the last minutes at the Alamo on March 6, 1836. Both authors write that Crockett wasn't born on a mountaintop in Tennessee; actually, he was born on a river valley in Franklin, a fledgling state that seceded from North Carolina and later, reluctantly, joined Tennessee. Named after Benjamin Franklin, the enclave to this day retains its special feeling. No, I won't get into the fray by saying Tennessee is leftover North Carolina, any more than I would describe Kentucky as leftover Virginia. Elongated states running from the Atlantic Ocean to the Mississippi River simply weren't viable in those days of miserable transportation and little or no roads. Following the road-trip tradition of Sarah Vowell and Tony Horwitz, Bob Thompson traces Crockett's many moves from the Tennessee river valley where he was born, to Washington, where he served three terms -- at various times -- in Congress, and on to Texas and the gates of the Alamo, seeking out those who know, love and are still willing to fight over Davy's life and legacy. I will not get into an argument over which book is better. One book good, two books better and so on is my feeling, when I want to choose a book about Crockett -- or anyone else. Both Wallis and Thompson have researched their subject thoroughly and both provide plenty of information for a reader. Their books should be read along with works like Hardin's "Texas Iliad" to understand the subject. In many ways, it's appropriate that the fiercely independent Crockett should have been born in Franklin: It existed from 1785 to 1789 when it was absorbed by Tennessee, failing in an attempt to become the 14th state and existing briefly as an independent republic. To this day in towns like Johnson City and Greeneville, Tennessee, you'll see signs on banks and other businesses paying tribute to its former independence. I think Crockett would like that! In his relatively short life, Crockett managed to be everything to everybody: Pioneer. Congressman who supported the poor over the well-to-do. Legendary bear hunter. Indian fighter. Supporter of Indian rights by voting against Andrew Jackson's Indian removal legislation (more about that). Iconic figure in Walt Disney's theme park, Disneyland, A hit TV show that made a star of Fess Parker and just about wiped out the raccoon population with a cap Crockett probably never wore. Uncle Walt Disney himself may have been pulling his writers' legs when he told them (page 250) that he was getting round-robin letters calling for the rescue of Crockett at the Alamo. The show's producers had to tell Walt that Davy Crockett died at the Alamo, that just about everybody died at the Alamo. As with all great legends, Davy Crockett's has been retold many times. Over the years, he has been repeatedly reinvented by historians and popular storytellers. In fact, one could argue that there are three distinct Crocketts: the real David as he was before he became famous; the celebrity politician whose backwoods image Crockett himself created, then lost control of; and the mythic Davy we know today. 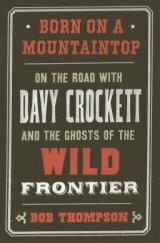 Crockett's opposition to Andrew Jackson's Indian removal policies and legislation is covered in "Born on a Mountaintop" and we quickly learn that it's yet another contradiction in the legend of Davy Crockett. On page 244 Thompson writes: "The hardest part of Disney's Crockett to defend is the absurd overhyping of his Indian Removal vote. It ignores his true political priority, trying to help poor whites settlers in west Tennessee, and it gives him a vastly bigger role in the Indian debate than he actually played or wanted to play. Perhaps most egregiously, it wimps out on criticizing the Great Man whose face now graces our $20 bills. Jackson's Indian policy isn't really his fault, Davy says: 'I've known General Jackson for half of my born life, and I'm sure he's got nothing but the good of the nation at heart.' Oh, Please. We're talking about a man who used the Creek War as an excuse to steal millions of land from Indians who fought on his side." Encyclopedic in scope, Thompson's book: > Examines the portrayals of Crockett by John Wayne in the 1960 "The Alamo" and by Billy Bob Thornton in the 2004 Touchstone version and finds both wanting in many aspects. (I personally prefer the casting of the 2004 version, which hews closer to the truth than the 1960 one). > Probes the many versions of how Crockett died. > Discusses the Mexicans, like Juan Seguin, who fought on the side of the Anglos, and the inner conflicts these men must have battled. Bob Thompson has hit a home run with "Born on a Mountaintop." BOB THOMPSON dropped out of graduate school with a major in history after just three weeks and has been trying to make up for this decision ever since. He spent 24 years as a feature writer for the Washington Post and the editor of its Sunday magazine. During his years at the newspaper, he was known for his pieces on the intersection of American history and myth. The father of two grown daughters, he lives in Washington, DC with his wife Deborah Johnson, a journalist turned children's book seller. "Born on a Mountaintop" is his first book. Website: www.authorbobthompson.com.